Heart's Delight Cards: Almost Forgot to Post Today! Yikes! I nearly missed my NaBloPoMo challenge. 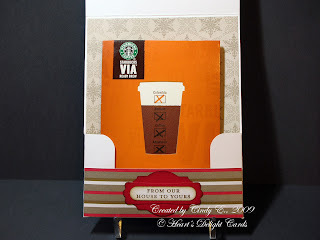 November is National Blog Posting Month, and the challenge over at Stampin' Addicts is to post something new every day. I got so busy with other stuff (spelled L-I-F-E, or more commonly known as - the conspiracy to keep me from my stamp cave), I almost forgot to upload this card! I've been a Starbucks fan for a while (gotta love that "motivation in a cup"), and now they have these adorable little portable packets of instant coffee, called Via. Now, before you gag and wretch and run for the door, let me tell you, I feel the same way about regular instant coffee, but this is so different, you'd NEVER know it was instant if nobody told you! Yes, it's that good! I love being able to make just one quick cup without dragging out the coffee beans, grinder, filter, etc. Yep, call me lazy..... Anyhoo, it comes in Italian Roast (very strong), and Columbian (not quite as strong). The directions say to mix it in 8 oz. hot water, but believe me, 16 oz. is a lot more like it (and I like my coffee strong!). So, I designed this little gift/coffee/tea bag/cocoa packet holder. It's a regular A2 card size. 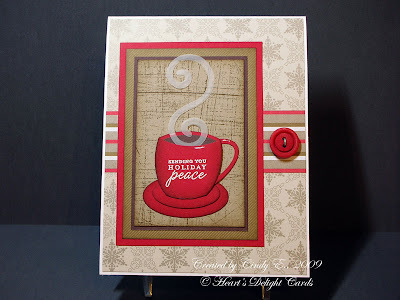 I cut the card base from a half sheet of 12x12 textured CS, added the DSP, and since I didn't have any coffee-themed stamps (gasp! ), I made my own mug using SU's three oval punches. Clever, 'eh? Edited to add: Click HERE for the punchy cup tutorial. Oh my goodness! I think that is the cutest thing I've seen in a long time! What a fun and beautiful card! I love the vellum steam coming out of the cup!